Brendan Riley is an Associate Professor of English at Columbia College Chicago, where he teaches a variety of courses in writing, new media, media studies, and, of course, zombies. 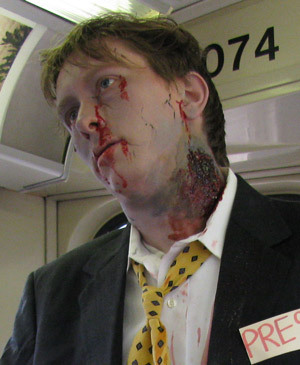 He has taught "Zombies in Popular Media" since 2007, and has presented on the subject in venues across the country. Dr. Riley also sits on the Zombie Research Society advisory board, and wrote the entries on Zombies and Necromancy for the 2012 World Book Encyclopedia. "The E-Dead" in Generation Zombie: Essays on the Living Dead in Modern Culture.Edited by Stephanie Boluk and Wylie Lenz. MacFarland, 2011. "Zombie People" in The Triumph of the Walking Dead: Robert Kirkman's Zombie Epic on Page and Screen.Edited by James Lowder. BenBella, 2011. "The Undead Gourmet" in Philosophy Now. Issue 96: May/June 2013. Dr. Riley serves as the Executive Director of Operations for the Popular Culture Association / American Culture Association (PCA/ACA), is a board member of the Midwest regional PCA/ACA, and an Editorial board member for the Journal of Popular Culture.